Developing your palate for tasting cigars comes down mostly to one thing: smoking lots of cigars and paying close attention to the flavors you notice. But that doesn’t mean there aren’t things you can do to accelerate the learning curve. For one, you can make sure your palate is clean. 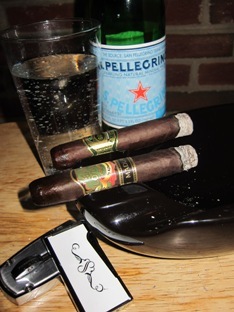 Sure, a neat scotch or a good rum on the rocks may be my preferred drink pairings, but there is no substitute for for some sparkling water when I want make sure I’m picking up the full spectrum of flavors in a cigar. An excellent, but less traditional, way to improve your ability to pick up nuances in cigar flavors is to light up two at the same time. By that I obviously don’t mean drawing on two cigars at once, but rather lighting up two and alternating tastes to pick up differences and similarities. The concept is standard in wine, where multiple similar wines are sampled either vertically (the same wine in different vintages) or horizontally (where multiple wines of the same vintage and type are sampled). The results can be striking. By tasting similar wines, it becomes easier to focus on the nuances and subtle differences. Light up a full-bodied Nicaraguan cigar and you’re likely to pick up the same general flavors: earth, spice, maybe leather or cedar. However, light up two different full-bodied Nicaraguans (as I recently did in the photo above) and you’ll notice more specifics, such as the type of spice (sweeter cinnamon versus black pepper). Secondary flavors, like cocoa, coffee, and clove will also begin to stand out. As long as you continue to keep your palate clean, you’ll be amazed at what flavors you can “discover” in a cigar when searching for differences between two cigars that smoked alone would be described in very similar terms. Plus, alternating between two cigars forces you to smoke each slowly, which will also help you notice the distinct qualities of each (smoking too quickly will overheat the tobacco and taint the flavor). You certainly wouldn’t want to smoke most of your cigars this way, because the fun of cigars is relaxing and reflecting, not having to worry about keeping multiple cigars lit or concentrating on the small details of the flavors. Still, if every so often you smoke two (or more) at once to exercise your palate, I think you’ll find it easier to enjoy all the depth and complexity that fine cigars have to offer. I never thought of smoking two cigars at once, but I'm going to give this a try. The closest I've come is my wife and I smoking two different cigars and then taking a few puffs of each other's from time to time. But I'm usually smoking something full-bodied and she's usually having something on the mild/sweet side, like a Fuente Short Story (she loves those). Finally, some cigar people who actually mention to pick up the full flavors of a cigar to NOT pair it with a drink like a scotch or cognac. I've tried to convince people of this for years with no success. Granted, I have a very refined palette, but there's a reason why sitting with someone smoking the same cigar and I don't have a drink and they do I get about 3 more flavors out of the cigar. Certain drinks will enhance CERTAIN flavors that exist but some flavors are usually lost exactly because of this enhancement of the drink to these flavors. Bravo on this fellas – you know your stuff. Now back to my Siglo VI. I am in the process of doing this now. This has been the best suggestion for me in learning the different notes in cigars. I am enjoying both cigars, and would smoke them both again, but they are vastly different side by side. It has helped me learn what different textures are, one is very creamy and the other is not. Also helped me realize I need to slow down some more when I smoke.